This is the Mac Version. The 77" StarBoard FXDUO Interactive Whiteboard is perfect for classrooms by allowing up to two inputs for multi-touch control on a durable, electronic-free surface. 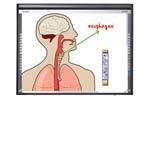 Until now your interactive whiteboard came with a choice: electronic pen-driven or stylus/finger-driven. Now you don't have to choose. The Hitachi FXDUO responds to pen or finger. It's low-reflection surface is kind on the eye and it caters for multiple users at once. Stand not included.